As the western gateway to Flores, and the launching pad for trips to Komodo National Park, the town of Labuan Bajo is enjoying a boom in tourism. An increasingly wide array of hotels, restaurants and other tourist amenities are popping up to suit every budget and style; meanwhile, the town retains the laidback feel of a sleepy harbour town. The sunsets in Labuan Bajo are among the most beautiful I’ve seen anywhere in the world, and, perhaps somewhat surprisingly, the town is also home to some of the best Italian food you’ll find in Indonesia. With the opening of the gleaming new terminal at Komodo Airport in 2013, Labuan Bajo is easier to reach than ever, and remains the best jumping-off point for trips to the islands of Komodo and Rinca to meet the fearsome Komodo dragon, the talisman of Indonesian wildlife tourism, in its natural habitat. There’s no greater illustration of Labuan Bajo’s tourism boom than the opening of the huge new terminal at Komodo Airport, which is expected to increase visitor numbers by ten times. The airport has connections across Indonesia, with direct flights to Denpasar and Jakarta, and Flores, with flights to Bajawa and Ende. This makes it easy to incorporate a trip to Komodo as part of a wider trip to Indonesia, or just as a flying visit if you live in the country. The flight time from Jakarta is around 2.5 hours, and from Denpasar around 1 hour and 15 minutes. Further expansion plans are in the pipeline, with the airport being upgraded to international status. Travelling by boat to Labuan Bajo remains a popular and scenic way of experiencing Flores’ beautiful coastline. Many visitors want to head straight to Labuan Bajo from Lombok, which removes the need for a long overland bus trip across Sumbawa. There are various boat companies, such as the popular Perama Tour, which offer trips between Lombok and Labuan Bajo, often stopping off at sites like Sumbawa’s Moyo Island and snorkelling spots in Komodo on the way. As ever, it’s worth pointing out that boat trips from Lombok are often postponed or delayed because of weather conditions; the Lombok Strait is one of the deepest bodies of water in the world and can be dangerous, so it’s important to make sure you do research and choose a reputable boat company. If you’re travelling overland from Lombok, you can buy a ticket which will encompass a ferry to Sumbawa, bus trip across Sumbawa, and a ferry to Labuan Bajo. Ferries for Flores depart from the port of Sape in the east of Sumbawa. While Labuan Bajo’s a wonderfully relaxing place to just sit back and put your feet up for a few days, there’s no doubting the star attraction here: the opportunity to see Komodo dragons on the nearby islands of Komodo and Rinca. The Komodo National Park also comprises several smaller islands, but these two are by far the most popular and offer the best chance of seeing the dragons. On Rinca, where the dragon populations are denser and the parched landscape provides less cover, sightings are all but guaranteed. Local wisdom has it, however, that the dragons are bigger on Komodo. Most visitors settle for a day-trip to Rinca, which is closer to Labuan Bajo. The travel agents which line Jl Soekarno Hatta, the town’s main strip, all offer boat trips to Rinca, including lunch, for around Rp 400,000 per person. The journey will normally be broken up with stops at snorkelling spots. Once you arrive at the park you’ll have to pay an entry fee, which includes a short guided tour. The guides are very knowledgeable and will help you explore the islands safely. Labuan Bajo is a small town and is easy to navigate on foot. 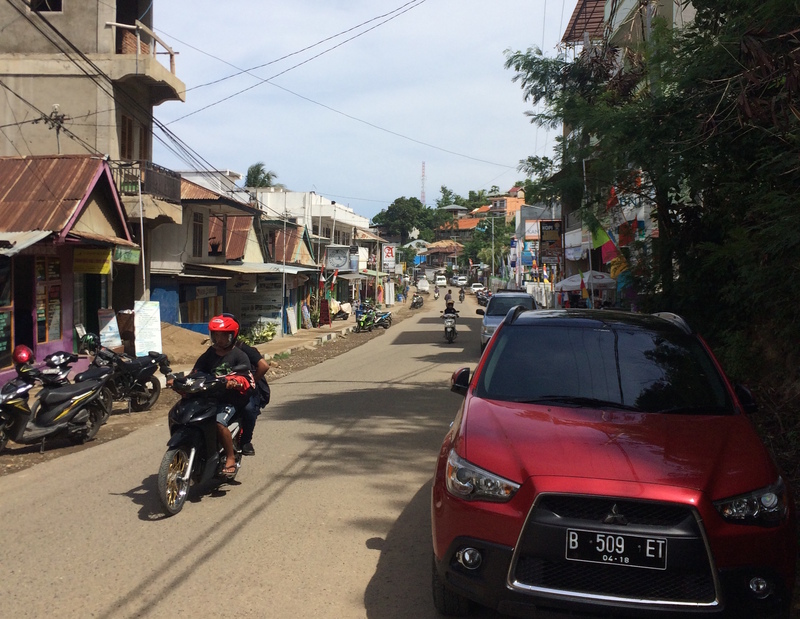 The airport is around 2km inland, and bemos run into town; taxis into town are also available for around Rp 50,000. If you’re leaving Labuan Bajo by bus, chances are your hotel will be able to book your seat and arrange for the driver to come and pick you up – otherwise, ask at one of the travel agents on Jl Soekarno. There’s no bus station per se in Labuan Bajo – they tend to gather near the harbour, but you will likely be picked up from wherever you booked your ticket. Labuan Bajo has a fantastic, and ever-expanding, range of accommodation options to suit all budgets. For the best view in town, head up the hill to Golo Hilltop, a lovely hotel run by a Dutch-Indonesian family. Budget travellers are well catered for at Bajo Sunset Hostel, and a great mid-range option is the lovely Green Hill Boutique Hotel, which has beautiful rooms staggered up the hillside above a stylish coffee shop and a decent restaurant. Those able to splurge who want to spend some time on the beach should look to one of the island resort hotels, which are increasingly rebranding as upmarket luxury resorts. Seraya Hotel & Resort has a beautiful setting on its own island north of town, and is the perfect place to dive, snorkel or just relax after a day’s adventures in Komodo National Park. For a small town, Labuan Bajo has a brilliant selection of restaurants, offering Indonesian and international cuisine. In particular, the town has a great selection of Italian restaurants. The pick of these is Made In Italy, which is a 15-minute walk south of town but worth it for the authentic pizza and pasta dishes. In town, Mediterraneo also offers superb Italian food alongside fresh grilled seafood, and has a stylish setting with colourful beanbags dotted around a wooden deck. A similarly stylish place for a drink is the funky Le Pirate, opposite Meditteraneo. For the best sunset views, head up the hill to Paradise Bar, which has regular live music and gets lively after dark. Labuan Bajo is a beautiful place to spend a few days, particularly after a gruelling bus or boat trip from Lombok or Sumbawa. It’s the place in Flores most amenable to tourists, which is only going to become more the case as visitor numbers continue to swell. Most of all, it’s the jumping-off point for one of the most magical travel experiences to be had not just in Indonesia, but anywhere: coming face-to-face with Komodo dragons in the wild. Have you ever visited Labuan Bajo? Share your tips about the town with other travellers in the comments below.